So having tarot cards and an oracle and the arcana stones AND a lenormand now got me thinking... and when I start thinking, sometimes I come up with some funny ideas. What would happen, for example, if I tried doing a reading that combined ALL of those? So I decided to do just that. 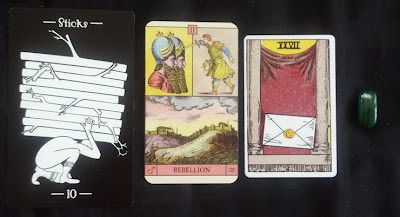 Rather than just read for myself as usual, I offered two experimental readings to members of the Aeclectic Tarot forums in exchange for feedback and permission to re-post them here. This is the first of these, including the feedback. I would like to know if there is potential for me to move to a job that is better suited to my personality anytime soon. Yup i can definitely understand this card, work is relentlessly busy due to staffing cuts with loads of non-negotiable deadlines made all the harder because i find the actual job painfully tedious so i can see where attitude might come in lol. The card that follows indicates the latter may be the case, in your situation. Here we have the card titled Rebellion, representing the energies of Mars in Aquarius. Mars is, of course, the planet of war, fire-energy, assertiveness, even aggression; Aquarius tends to be very independent-minded, one that judges the merits of something according to their own principles and values, and not what anyone else might say. Aquarius doesn't tend to just go along when things don't feel like they are working, don't feel right. Here, in the bottom of the image we see a fort, well-defended, well-established. Going up against it can be a difficult prospect, moreso if you consider the authority and power behind it...and yet there, above it, a youth is doing just that - challenging the stylized, ritualized, static figures of authority, of established things. There is not enough freedom in this work situation for you to be happy - the personality aspect of your question, I take it - and you are ready, deep down, to do something about it. You should, in fact, this card says, do something about it, rebel against that burden you are feeling. This made me snigger a bit because it sounds soooo like me. I work in a typical bureaucracy where there are established ways of doing things regardless of whether or not it makes sense and i'm forever kicking against it. I also tend to value the differences in people and believe everyone has a right to be themselves without judgement but some of the people i work alongside have very rigid views about how people should think/act etc and can often be incredibly petty. Needless to say i don't particularly conform to their world view which doesn't trouble me though it can get wearing at times and i just can't find it in me to go along with them for an easy life lol !!! And how? On the other side of this card we have the Letter. This card can represent communication, reaching out, and also physical things - letters, documents, diplomas. In this context, this makes me think of resumes - have you updated it recently, perhaps asked someone knowledgeable to look it over for you? What about cover letters? It can be easier to job search with confidence when you know that your 'paperwork' is up to par, and if you haven't started the process yet, it can be a good first step. If you've been thinking of going back to school or some kind of training/course or such, this card suggests that it might be wise - another certificate/diploma/thing to put down on paper might help you along in your search for better work. Lastly, looking at communication more broadly - have you though about how you might network? Phone calls, emails, social networks - anyone who might know of something more suitable thats hiring or the like? Even if it doesn't pay off right away, it might help you to maintain those links in the future. Although I have a fairly high level of education already because I'd like to try a completely different path, i have been thinking about looking at further study recently though finances are a sticking point for now. It's a good point about updating the resume which is something i haven't looked at in a long time! 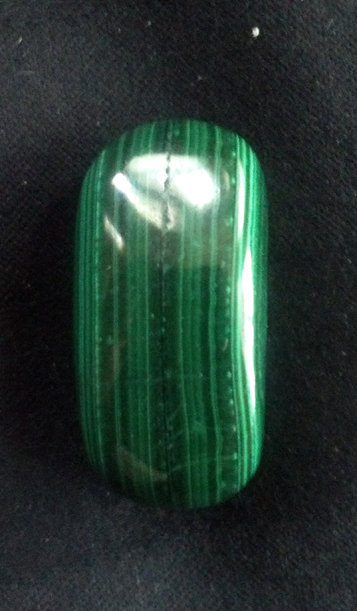 Finally, we have the Malachite stone, representing the Empress, which I think ties up the reading quite well. Following the letter card, I think it gives a nice emphasis to the message there - work on developing your credentials, skills, on nurturing those aspects of yourself that will help you advance in your professional life and help you get to where you want to/would rather be. This can be the paper-work stuff, but can also be about nurturing yourself more broadly - about having and projecting confidence, in feeling surer of yourself when you interview, in believing that you deserve to have a job that isn't so burdensome, that you can succeed in finding one and excelling in it. It also emphasizes, I think, that your feelings of 'rebellion' against your current work situation are appropriate: getting out of it will help you grown, perhaps allow your creative side to develop more as well. If you get any flashes of inspiration - ideas of where to apply, who to try to reach out to, perhaps trying to do something more like starting a business of your own, anything like that - don't be afraid to pursue them and see where it goes. Interestingly I do want to find something that is more creative and have toyed with ideas on looking at self employment though as yet no idea has firmly taken root but maybe i just need to explore that a bit deeper. Thank you for the reading, it all made sense and tied in quite well with what's going on around me at the moment and has validated some of the things i've been considering.